Mers-el-Kebir and Oran, Morocco, 3 July 1940: A British task force destroyed or rendered unusable the French Navy’s most important warships. The military objective was to keep them out of the hands of the Germans after France had signed an armistice with Germany. Politically, however, the act had greater consequence. It convinced the world—particularly Roosevelt and the United States—that Britain would fight to the finish. It would “go on to the end,” as Churchill had declared. 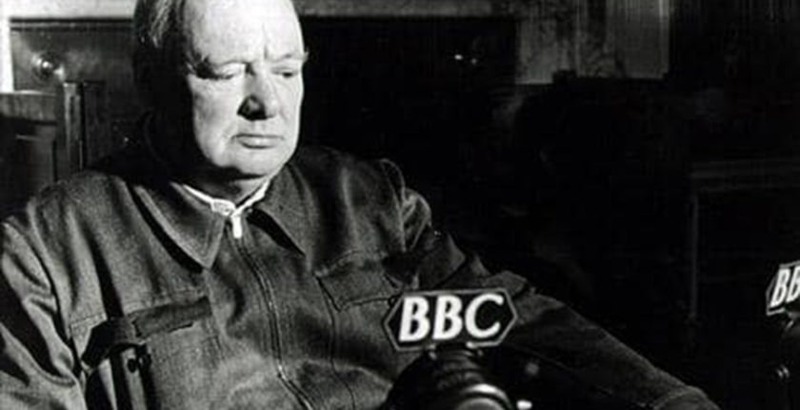 “Unknown Warriors” was Churchill’s fourth broadcast as Prime Minister. It discussed, first, the controversial naval attack on Britain’s former ally. Secondly and more important, it offered Britons reasons for optimism. It is, Mr. Cohen notes, “more obscure than other broadcasts from that stirring summer.” But this is the original broadcast as heard at that time over the BBC. There is singularity about this. “That melancholy phase in our relations with France has, so far as we are concerned, come to an end…. Let us think rather of the future. Today is the 14th of July, the national festival of France. A year ago in Paris I watched the stately parade down the Champs Élysées of the French Army and the French Empire. Who can foresee what the course of other years will bring? “And now it has come to us to stand alone in the breach, and face the worst that the tyrant’s might and enmity can do. Bearing ourselves humbly before God, but conscious that we serve an unfolding purpose, we are ready to defend our native land against the invasion by which it is threatened. “We are fighting by ourselves alone; but we are not fighting for ourselves alone. Here in this strong City of Refuge which enshrines the title-deeds of human progress and is of deep consequence to Christian civilisation; here, girt about by the seas and oceans where the Navy reigns; shielded from above by the prowess and devotion of our airmen—we await undismayed the impending assault. Perhaps it will come to-night. Perhaps it will come next week. Perhaps it will never come.